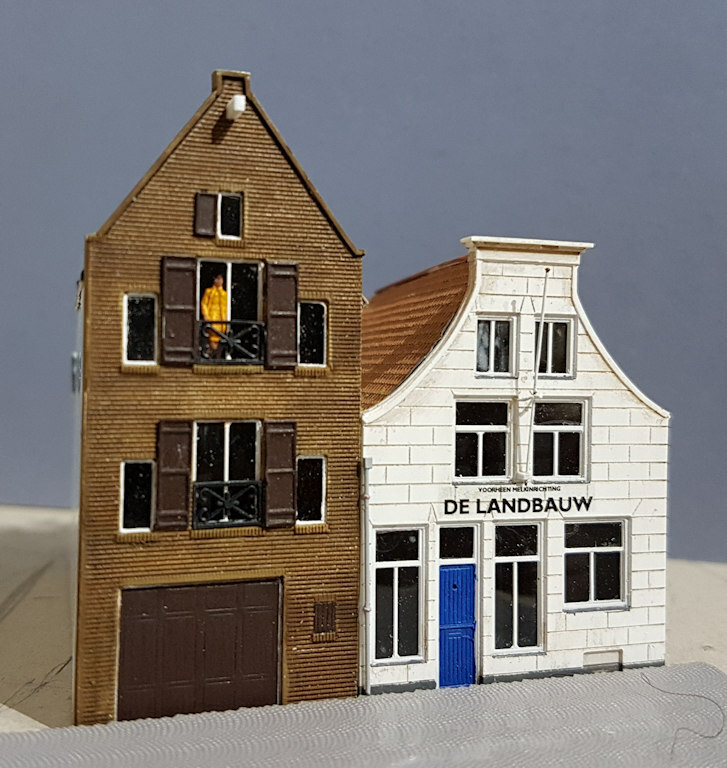 3 of the row of canal side buildings have been completed. These use parts from a Kibri kit with some scratch building and laser cut parts. They now need to be fixed together and the join filled. The Chinese frontage is 3D printed from Rail N Scale, and the decal is a home made copy of a real painted sign. The Church and Town Hall are from Kibri kits. 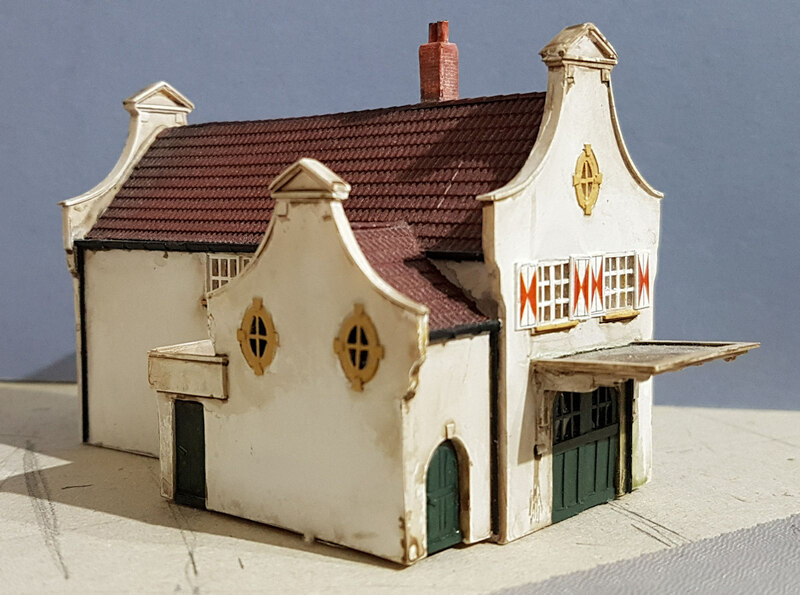 The Station now has a roof and is in the process of being weathered. The interior still needs to be built. I then started to look at real track plans to see what was typical (see SporenplanOnline) and if any real location would fit the requirements. The track plan I have finally come up with is based on a section of track at Nijmegen, and many other stations have similar arrangements. There are 3 tracks passing between the 2 main platforms with release crossings in the centre and further loops forming an island platform and freight bypass line. There is also a bay platform at one end. 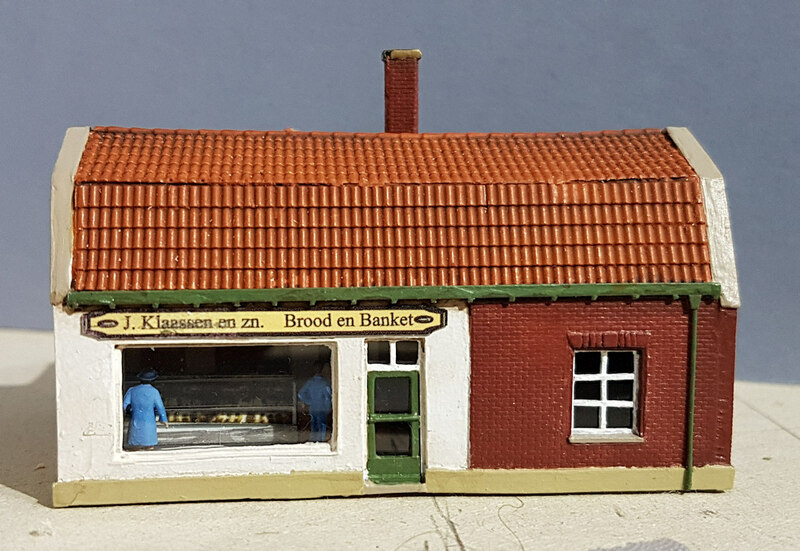 The station building is based on those at Zwolle and Dordrecht which were built in the late 1800s by the Staats Spoorwegen which I felt suited the older canalside buildings (based on those in Amsterdam and Utrecht) I was planning. 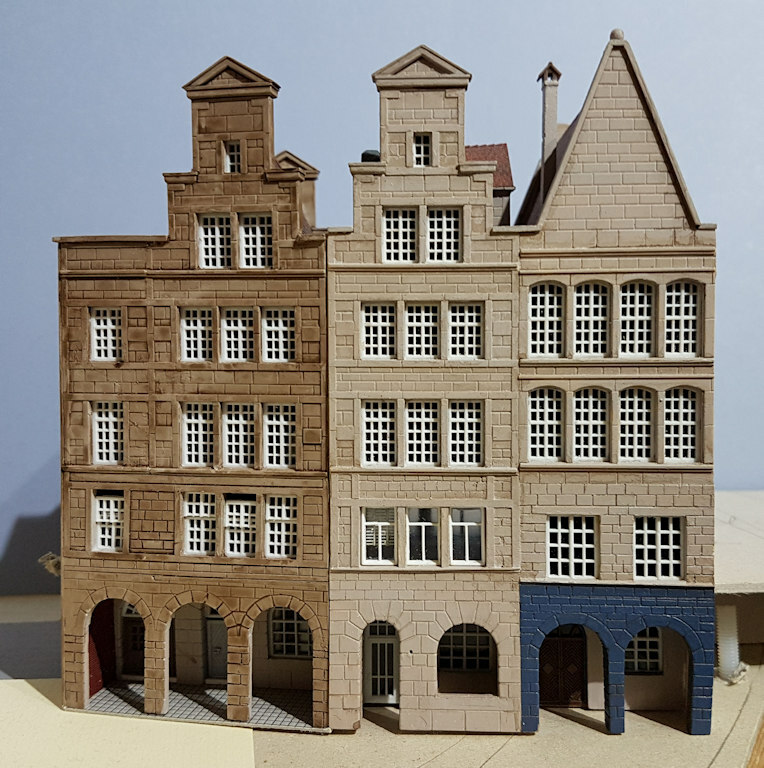 Kibri produce a station with similar architectural features which I will assemble in a totally different form than they intended which will be close enough to the real thing. 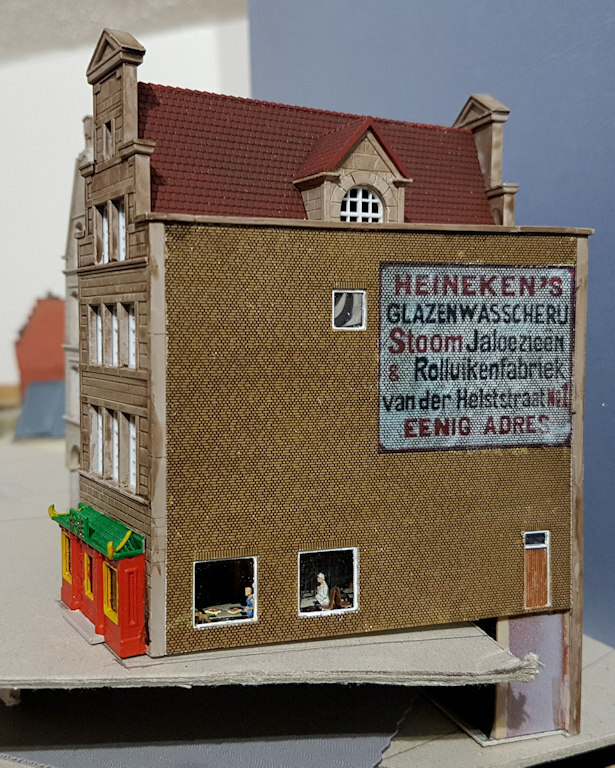 The roof will need to be scratch built but as the real Zwolle was rebuilt without chimneys that should be a simple job. The space available is 3.6m long at one side and 3m on the other as a L shape and since I had decided to make the layout on 2 levels thought that 900mm boards would be about right for weight and ease of handling. To do this I made a full size template of the layout boards in 2mm grey card and laid the Peco point templates down to form the point work, then I made some straight track on the PC and laid this to get the overall effect. Next, I printed some pictures of building and cut them out and placed them around to form possible streets. The 2mm card can be used to make features such as bridges which can then be placed and moved about to see how it best fits. The Kibri station was scanned to produce a paper building of the required shape. No doubt this planning and modelling can all be achieved on the PC these days (and possibly someone may like to write about this!) but I like the solid approach. With a small amount of adjustment to make sure points were not over board joints I found that the 900mm board spacing worked very well. Next, think about train movements. Are the platforms long enough, can you get two trains in them simultaneously, can the freight get past the passenger trains. This all seems to work so construction has started on the lower level yard consisting of 11 loops between 2.7 and 3.5m in length, long enough for the intercity trains (approx 2.1m for a class 1700+12 coaches) or the long freight (approx 2.6m for a class 1700+20 container flats). These lines are spaced far enough apart that I can get my fingers between rows of stock. At each end are spirals taking the track up to the scenic sections above. In this way the whole of the top surface of the layout is scenic. This is all working correctly now with point control using DS64s operating Conrad point motors and train detection on the spirals using BDL168s. This is essential due to the length of hidden track, so each turn is a section for detection purposes. Boards are constructed from birch ply, with legs made from Ikea shelf supports. Alignment is by pattern makers dowels and held together with clips. Control is by Digitrax DCC for trains and points. Local panels will also display track occupation and have route setting push buttons. Signals will be added latter and will most likely operate in combination with the points. The controls are mounted at the center of the layout on a shelf with bus wires running in both directions to power the track. Districts are protected by PSX circuit breakers: left yard and spiral, right yard and spiral and the upper level tracks. The overall look of the layout is as follows: on the left is the town scene covering one of the spirals. This then gives way to the station scene, which ends at the large canal. This is spanned by a double track Kato bridge, nearly 500mm in length. Behind this, in the corner, is an industrial/dock scene, the centre piece of which will be the VOC Batavia. On the right hand side of the layout is a more rural scene with a large wooded area covering the second spiral. This is a mixture from many manufacturers with the common Dutch locos and trains: 1600, 1700, 1800s with ICK and ICR stock, 6400, Koplopers, etc plus trains from Germany and the open access operators: class 189, 66, etc. The double deck stock will make an appearance but this needs to be built as there are no commercial models, at least, not at sensible prices. Buildings are from Kibri, Faller, Pola, Artitec, Tilly etc and range from kits as intended, kit bashed and some will be scratch built. Boats mostly from Artitec although there is one from Tomytec, which will be detailed. Station building: this is being constructed using a Kibri kit but assembled in completely the wrong order. Kibri will probably not recognise it! The basic shell has been assembled and sprayed with a white acrylic primer to cover the odd blue colour of the kit. Windows are being fitted and any gaps will be filled. Then another coat of primer. The roof will need to be scratch built from Evergreen "raised seem" roof sheets.